We’re delving deep into the back catalogue today, 3.5 years back in fact. 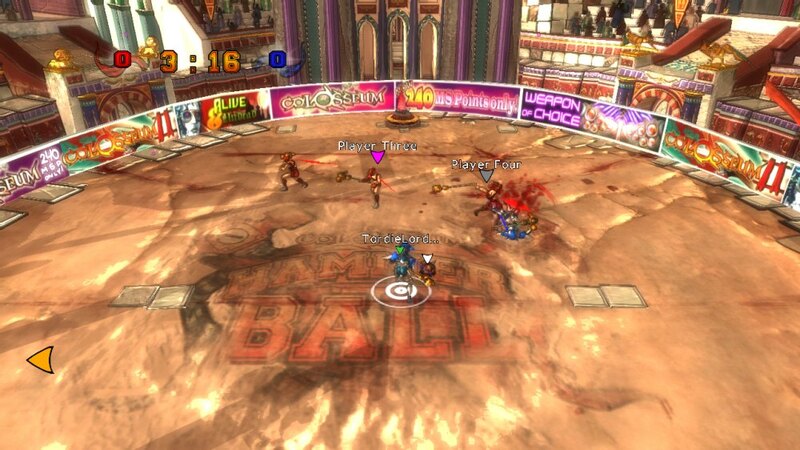 “Colosseum: Hammerball” is a side-story to a launch title for the Xbox Live Indie Games service called Colosseum. Hammerball, however, blends colosseum fighting with team sports, creating a hybrid that reminded me in no small part of the Bitmap Brothers classic “Speedball 2” (which I had on the Amiga, and years later bought on XBLA). Like with Speedball 2, “Colosseum: Hammerball” has you having to fight your way through opponents to the goal to score with the ball. Whereas Speedball 2 tried to mimic the feel of European handball, here hockey is the inspiration for the sports side (with Roman colosseums the inspiration for the combat side). For a mere 80 Microsoft Points, I highly recommend this to people who played and fondly remember Speedball 2, Wild Cup Football, or any of the other combat/sports hybrids that have come out over the years. Day 886: Squid Yes! Not So Octopus!